Concentrating on children’s culture, developmental psychology, childcare and primary education, the Faculty of Human Studies aims to provide students with a pathway for studying the nature of humanity and learning how to help others. 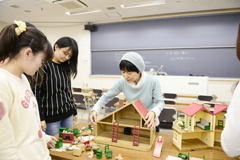 With its distinctive focus on creative techniques and a learning environment that encourages students to weave together their own stories, the Department of Children’s Culture is the only university faculty in Japan where students can devote their studies to children’s literature and culture. The Department of Children’s Culture aims to nurture students’ imagination and creativity through research into children’s literature and culture, which help form the environments that children inhabit, and experiences in the creative processes of writing picture books and children’s stories. In the Department of Children’s Culture, students encounter a diverse mix of children’s literature from Japan and around the world, learn about the contexts that shaped various works, and thereby understand the countries, periods, and social frameworks of the literature. Courses also delve into the contemporary age, exploring trends in toys, animation, games, characters, and the rest of the elements that currently populate children’s cultural milieu. Offering a wide range of courses in creative writing, picture book design, animation, and other creative media, the Department of Children’s Culture has educated numerous authors, creators, and graduates who have gone on to work at publishing houses, toy companies, children’s clothing manufacturers, and more. Students in the Department of Children’s Culture, which emphasizes the literature and culture that fill children’s lives, develop a sound understanding of what makes children who they are and what kinds of environments they live in. By examining the differences in the perceptions and value systems of adults and children, as well, students gain the ability to approach things from different viewpoints and foster new forms of culture that help bridge the gaps between the young and the old. How do people grow, develop, and change? Hoping to uncover answers to these questions, the Department of Developmental Psychology focuses on helping students understand the lifelong process of mental development and approaches to mental care. 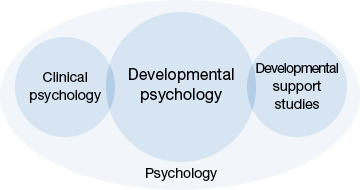 As students study the scientific underpinnings of the mental development process, the Department of Developmental Psychology emphasizes the importance of understanding others, thinking logically, and learning the proper ways of responding to various mental issues. Students in the Department of Developmental Psychology cultivate a deeper understanding of people by exploring mental growth and development in terms of both individual internal factors—genetics and personality, for example—and external factors. Ranging from fundamental theory to the latest findings in the psychological world, the Department of Developmental Psychology curriculum also covers non-developmental topics such as the mechanisms of human behavior and many other elements. Students also learn how to corroborate hypotheses on mental issues as they practice gathering and analyzing data and conduct various experiments and investigations. The Department of Developmental Psychology also offers a full selection of courses on clinical psychology, a field that centers on providing psychology-based support to people with developmental disorders, mental illnesses, and other issues, as well as their families. Interested students can pursue further study in the graduate school, where they can work to obtain clinical psychologist certification and engage in specialized research. The Department of Child Care and Primary Education, which offers specialized tracks for early childhood education and primary education, trains students to become professional, knowledgeable educators with the abilities to connect and grow together with children. The Department of Child Care and Primary Education aims to train educators and childcare workers who combine the ability to provide children with formative opportunities and experiences with a respect for individuality, a determination to continue learning, and an openness to reencountering the world with children. The Department of Child Care and Primary Education features two tracks: the Early Childhood Education track, which allows students to obtain kindergarten teacher’s licenses and childcare worker certification, and the Primary Education track, which focuses on elementary school teacher’s license acquisition. Students on the Early Childhood Education track gain specialized knowledge and experience with applied techniques in both childcare and education, while those on the Primary Education track develop the skills needed to teach all elementary school subjects and support children as they grow. The Early Childhood Education track gets started right away with practical education, exposing students to childcare worker theory, general childcare theory, practicum courses, and training courses from the first year onward. Students can also select from courses in related fields like psychology, children’s literature, and children’s culture. Starting in their first year of enrollment, students on the Primary Education track learn teaching methods for all academic subjects. In order to establish a better, fuller understanding of childhood development, students are also encouraged to take courses in related fields and courses from the Early Childhood Education track. Every facet of a child’s life—from play to study—is a context for growth. In addition to mastering the teaching techniques for specific subjects like music, art, and physical education, students on the Primary Education track also learn how they can enhance children’s ability to “live fully” in day-to-day life settings through extensive on-site training at childcare facilities and educational institutions. Professional educators need to have a broad base of knowledge and sensitive awareness. Taking advantage of the unique features of the Department of Child Care and Primary Education, the Primary Education track gives students a wealth of opportunities to learn in related academic fields like children’s culture and developmental psychology—areas full of valuable insight into the nature of children.